When Josh and I got pregnant, we knew that we didn’t want our lives to look all that much different than they did before we had kids. We loved getting out and trying new restaurants, hiking exploring new cities. And we decided that our kids would just come along for the ride once they joined the fam. Extra pair of shoes. Although it might be ok to keep these in the car for after the hike in case you’re planning on grabbing a bite to eat or running errands before going home. I don’t know how many extra pairs of shoes we have in our car but I’m confident a pair will always be there when we need them. Snacks. No one likes being out with a hungry toddler. Especially the hungry toddler. Bonus points if this is a treat the kids can look forward to like homemade trail mix. A hat to protect from sun or rain, should it become an issue. Jacket. Depending on where you’re hiking, it could be cold and windy at the end of your hike! Josh and I have had to endure freezing hikes because we gave our sweatshirts to the kids (because the base camp was warm and the top was very much not). We have the Chicco SmartSupport Backpack. 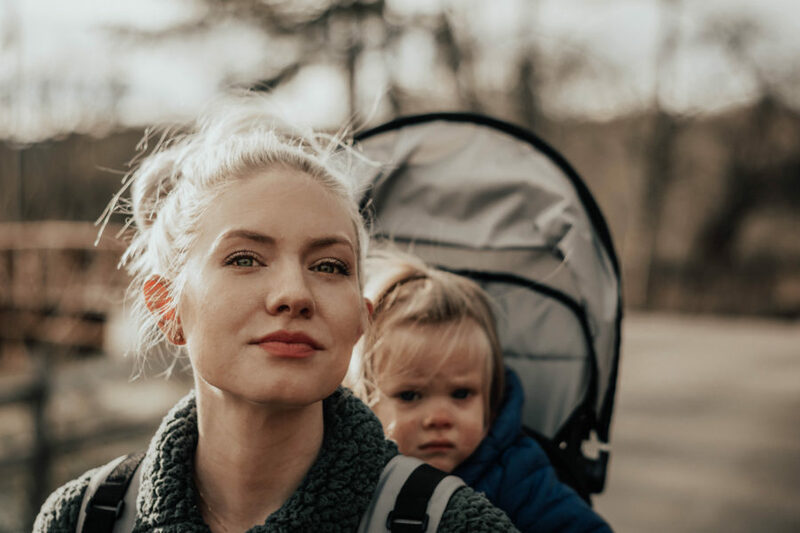 I love this baby backpack because it does and will grow with the kids. If I’m going to spend money on baby gear, I hate the idea of only using it for a few months and then giving it away or keeping it in storage. The Chicco SmartSupport Backpack is wonderful because, at the moment, we can use it carry BOTH Evy and David! It holds up to 40 lbs and David, the peanut that he is, is still under the weight limit. Which is great for us because half the time when we expect to use this backpack, we think it’ll be for Evy when- just kidding- David is the one who is completely done with walking. I also can sometimes have a bad back and I need all the support I can get when carrying the kids. This backpack has an aluminum frame, making it extremely light, as well as lumbar support so your back isn’t killing you at the end of your walk. 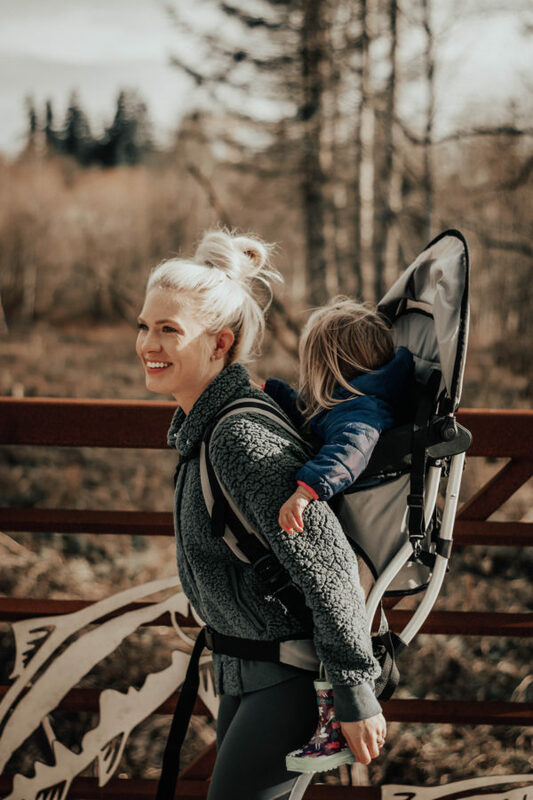 I also love that the Chicco SmartSupport Backpack also has an adjustable canopy that can help provide shade from the sun or rain if that becomes an issue during your hike. I also find it’s freestanding ability really useful when we stop for breaks or a snack! 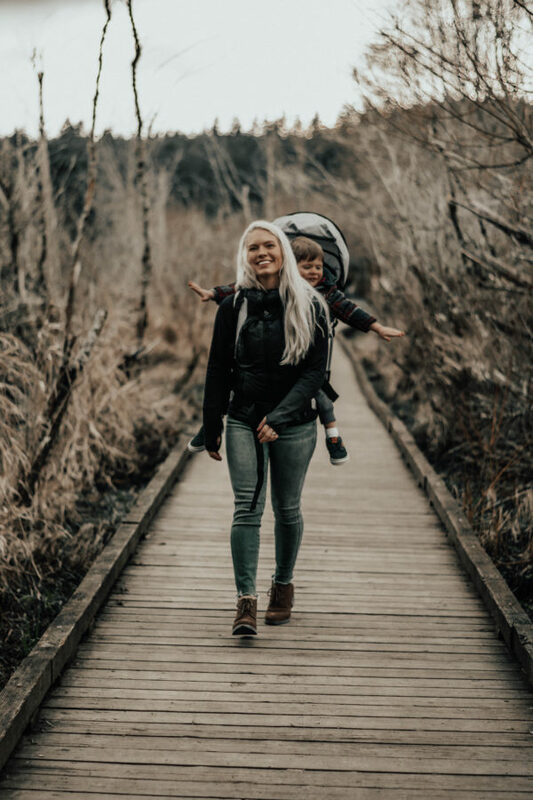 Overall, Josh and I love to use this backpack for long and short walks with the kids, and the kids love hitching a ride to the end of the hike. Beware taking your kids on a hike you’re not familiar with, try a trial run when it’s just you and your partner. Be sure to download the map of the area you’ll be hiking on your phone in before you lose service. This has been a lifesaver for us when traveling in the past! Keep in mind the time it’ll take to get back. Kids only last so long, you don’t want to find yourself in the place that’s furthest from where you started when kids begin to break down. 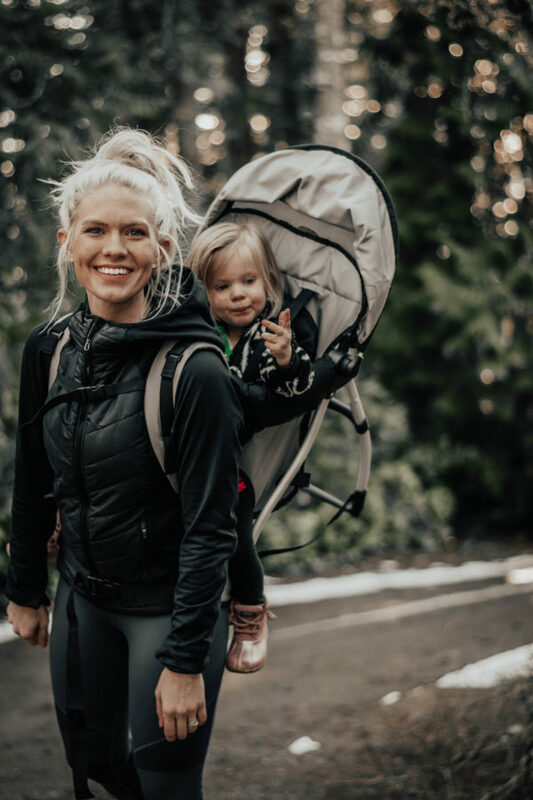 If can make it to your turnaround point while the kids are still enjoying your hike, you might just make it back without having to carry tired and grumpy babies. Plan the time you start your hike. Of course, any seasoned parent knows that when you leave the house with kids, you need to budget enough time to make it home before nap/bedtime. Generally, I feel like our kids are way more up for adventures in the morning so try getting out early! Don’t rush it. If you have it in your head that you want to complete the entire hike, you might need to be a little flexible with that goal. Also, be sure to take your time and enjoy the hike! When your kids stop to look at the sticks and leaves, look at it with them. Yes, your hike will take longer. But I’ve found that if we keep the attitude of our hike positive and exciting, the kids last way longer than if we try to rush them to make it to the end. Make it a game. Toddlers love challenges! If you can create a scavenger hunt (or if you forget to plan one, a game of “I spy”), the kids will be much more focused on the fun rather than keeping up with mom and dad. As a general rule, the idea is to pack smart. Don’t pack more than you need as you’ll probably be the one carrying it all back, but do keep certain scenarios in mind like hunger, bathroom breaks, weather, etc. After a few hikes, you’ll find that investing in a couple high-quality pieces of gear will go a long way and serve your family for years to come. 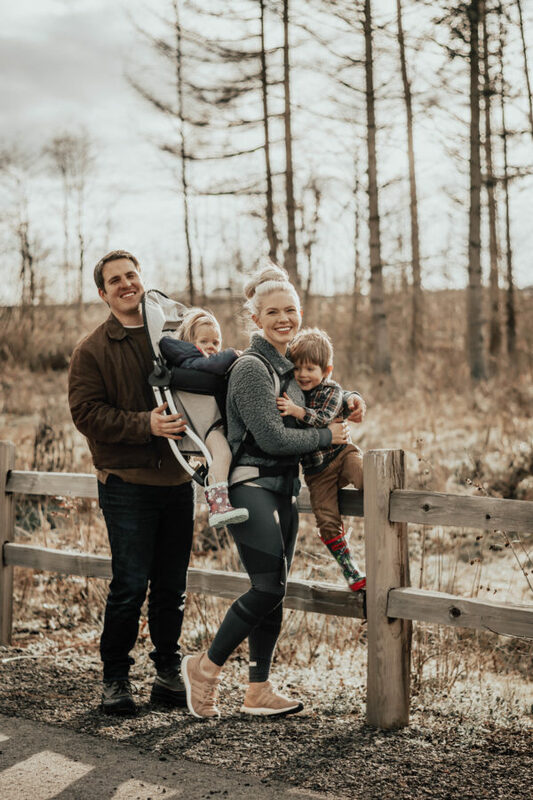 We love using our Chicco SmartSupport Backpack because we know it’s strong enough to hold the kids and light enough to take anywhere. Pick one up for your next walk through town or grand adventure!